The Four Who Entered Paradise. An esoteric system of theology and philosophy. It presents one of the most obscure and complicated problems in the general history of religion. It forced itself into prominence in the first centuries of the common era, and the Church Fathers were constrained to undertake its refutation. Writers on the history and dogmas of the Church have therefore always devoted much attention to the subject, endeavoring to fathom and define its nature and importance. It has proved even more attractive to the general historians of religion, and has resulted during the last quarter of a century in a voluminous literature, enumerated by Herzog-Hauck ("Real-Encyc." vi. 728). Its prominent characteristic being syncretism, the scholars, according to their various points of view, have sought its origin, some in Hellenism (Orphism), some in Babylonia, others elsewhere. This question, however, can not be discussed here, as this article deals with purely Jewish gnosticism. Jewish gnosticism unquestionably antedates Christianity, for Biblical exegesis had already reached an age of five hundred years by the first century C.E. Judaism had been in close contact with Babylonian-Persian ideas for at least that length of time, and for nearly as long a period with Hellenistic ideas. Magic, also, which, as will be shown further on, was a not unimportant part of the doctrines and manifestations of gnosticism, largely occupied Jewish thinkers. There is, in general, no circle of ideas to which elements of gnosticism have been traced, and with which the Jews were not acquainted. It is a noteworthy fact that heads of gnostic schools and founders of gnostic systems are designated as Jews by the Church Fathers. Some derive all heresies, including those of gnosticism, from Judaism (Hegesippus in Eusebius, "Hist. Eccl." iv. 22; comp. Harnack, "Dogmengesch." 3d ed. i. 232, note 1). 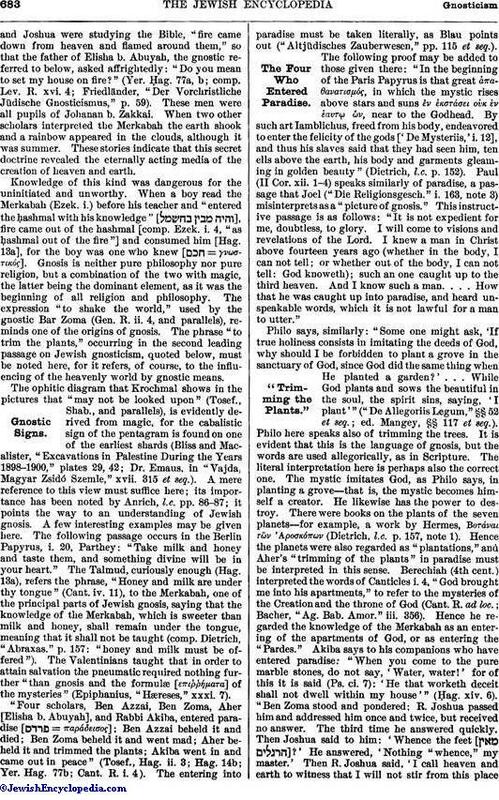 It must furthermore be noted that Hebrew words and names of God provide the skeleton for several gnostic systems. Christians or Jews converted from paganism would have used as the foundation of their systems terms borrowed from the Greek or Syrian translations of the Bible. This fact proves at least that the principal elements of gnosticism were derived from Jewish speculation, while it does not preclude the possibility of new wine having been poured into old bottles. Cosmogonic-theological speculations, philosophemes on God and the world, constitute the substance of gnosis. They are based on the first sections of Genesis and Ezekiel, for which there are in Jewish speculation two well-established and therefore old terms: "Ma'aseh Bereshit" and "Ma'aseh Merkabah." Doubtless Ben Sira was thinking of these speculations when he uttered the warning: "Seek not things that are too hard for thee, and search not out things that are above thy strength. The things that have been commanded thee, think thereupon; for thou hast no need of the things that are secret" (Ecclus. [Sirach] iii. 21-22, R. V.). The terms here emphasized recur in the Talmud in the accounts of gnosis. 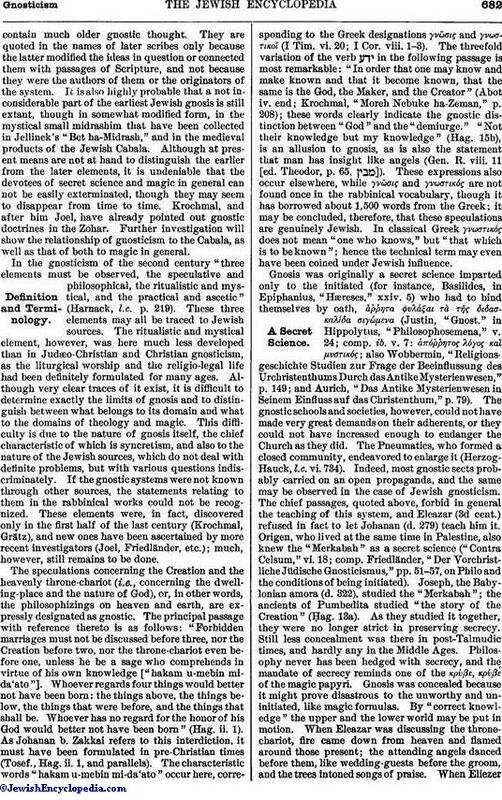 "There is no doubt that a Jewish gnosticism existed before a Christian or a Judæo-Christian gnosticism. As may be seen even in the apocalypses, since the second century B.C. gnostic thought was bound up with Judaism, which had accepted Babylonian and Syrian doctrines; but the relation of this Jewish gnosticism to Christian gnosticism may, perhaps, no longer be explained "(Harnack," "Geschichte der Altchristlichen Litteratur," p. 144). 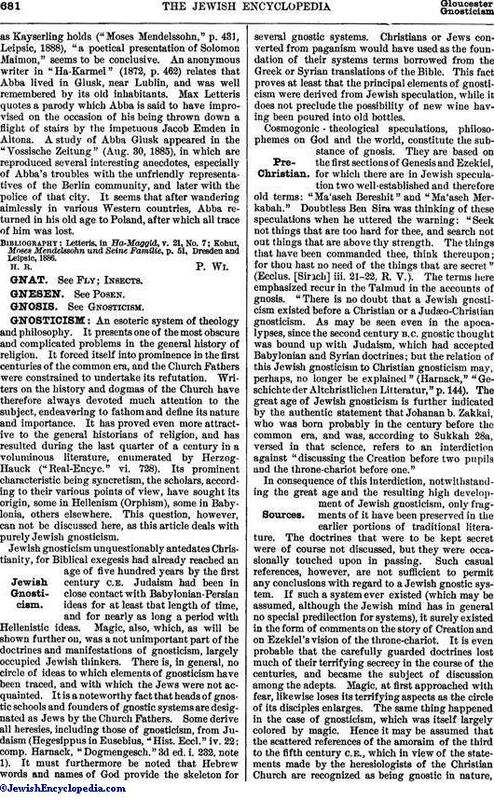 The great age of Jewish gnosticism is further indicated by the authentic statement that Johanan b. Zakkai, who was born probably in the century before the common era, and was, according to Sukkah 28a, versed in that science, refers to an interdiction against "discussing the Creation before two pupils and the throne-chariot before one." In consequence of this interdiction, notwithstanding the great age and the resulting high development of Jewish gnosticism, only fragments of it have been preserved in the earlier portions of traditional literature. The doctrines that were to be kept secret were of course not discussed, but they were occasionally touched upon in passing. Such casual references, however, are not sufficient to permit any conclusions with regard to a Jewish gnostic system. If such a system ever existed (which may be assumed, although the Jewish mind has in general no special predilection for systems), it surely existed in the form of comments on the story of Creation and on Ezekiel's vision of the throne-chariot. It is even probable that the carefully guarded doctrines lost much of their terrifying secrecy in the course of the centuries, and became the subject of discussion among the adepts. Magic, at first approached with fear, likewise loses its terrifying aspects as the circle of its disciples enlarges. The same thing happened in the case of gnosticism, which was itself largely colored by magic. Hence it may be assumed that the scattered references of the amoraim of the third to the fifth century C.E., which in view of the statements made by the heresiologists of the Christian Church are recognized as being gnostic in nature,contain much older gnostic thought. They are quoted in the names of later scribes only because the latter modified the ideas in question or connected them with passages of Scripture, and not because they were the authors of them or the originators of the system. It is also highly probable that a not inconsiderable part of the earliest Jewish gnosis is still extant, though in somewhat modified form, in the mystical small midrashim that have been collected in Jellinek's "Bet ha-Midrash," and in the medieval products of the Jewish Cabala. Although at present means are not at hand to distinguish the earlier from the later elements, it is undeniable that the devotees of secret science and magic in general can not be easily exterminated, though they may seem to disappear from time to time. Krochmal, and after him Joel, have already pointed out gnostic doctrines in the Zohar. Further investigation will show the relationship of gnosticism to the Cabala, as well as that of both to magic in general. In the gnosticism of the second century "three elements must be observed, the speculative and philosophical, the ritualistic and mystical, and the practical and ascetic" (Harnack, l.c. p. 219). These three elements may all be traced to Jewish sources. The ritualistic and mystical element, however, was here much less developed than in Judæo-Christian and Christian gnosticism, as the liturgical worship and the religio-legal life had been definitely formulated for many ages. Although very clear traces of it exist, it is difficult to determine exactly the limits of gnosis and to distinguish between what belongs to its domain and what to the domains of theology and magic. This difficulty is due to the nature of gnosis itself, the chief characteristic of which is syncretism, and also to the nature of the Jewish sources, which do not deal with definite problems, but with various questions indiscriminately. If the gnostic systems were not known through other sources, the statements relating to them in the rabbinical works could not be recognized. These elements were, in fact, discovered only in the first half of the last century (Krochmal, Grätz), and new ones have been ascertained by more recent investigators (Joel, Friedländer, etc. ); much, however, still remains to be done. The speculations concerning the Creation and the heavenly throne-chariot (i.e., concerning the dwelling-place and the nature of God), or, in other words, the philosophizings on heaven and earth, are expressly designated as gnostic. The principal passage with reference thereto is as follows: "Forbidden marriages must not be discussed before three, nor the Creation before two, nor the throne-chariot even before one, unless he be a sage who comprehends in virtue of his own knowledge ["hakam u-mebin mida'ato"]. Whoever regards four things would better not have been born: the things above, the things below, the things that were before, and the things that shall be. Whoever has no regard for the honor of his God would better not have been born" (Ḥag. ii. 1). As Johanan b. Zakkai refers to this interdiction, it must have been formulated in pre-Christian times (Tosef., Ḥag. ii. 1, and parallels). The characteristic words "hakam u-mebin mi-da'ato" occur here, corresponding to the Greek designations γνῶσις and γνωστικοί (I Tim. vi. 20; I Cor. viii. 1-3). The threefold variation of the verb in the following passage is most remarkable: "In order that one may know and make known and that it become known, that the same is the God, the Maker, and the Creator" (Abot iv. end; Krochmal, "Moreh Nebuke ha-Zeman," p. 208); these words clearly indicate the gnostic distinction between "God" and the "demiurge." "Not their knowledge but my knowledge" (Ḥag. 15b), is an allusion to gnosis, as is also the statement that man has insight like angels (Gen. R. viii. 11 [ed. Theodor, p. 65, ]). These expressions also occur elsewhere, while γνῶσις and γνωστικός are not found once in the rabbinical vocabulary, though it has borrowed about 1,500 words from the Greek; it may be concluded, therefore, that these speculations are genuinely Jewish. In classical Greek γνωστικός does not mean "one who knows," but "that which is to be known"; hence the technical term may even have been coined under Jewish influence. Gnosis was originally a secret science imparted only to the initiated (for instance, Basilides, in Epiphanius, "Hæreses," xxiv. 5) who had to bind themselves by oath, ἄητα φυλάξαι τὰ τῆς διδασκαλίδα σιγώμενα (Justin, "Gnost." in Hippolytus, "Philosophosemena," v. 24; comp. ib. v. 7: ἀπόῤῥητος λόγος και μυστικός; also Wobbermin, "Religions-geschichte Studien zur Frage der Beeinflussung des Urchristenthums Durch das Antike Mysterien wesen," p. 149; and Aurich, "Das Antike Mysterienwesen in Seinem Einfluss auf das Christenthum," p. 79). The gnostic schools and societies, however, could not have made very great demands on their adherents, or they could not have increased enough to endanger the Church as they did. The Pneumatics, who formed a closed community, endeavored to enlarge it (Herzog-Hauck, l.c. vi. 734). Indeed, most gnostic sects probably carried on an open propaganda, and the same may be observed in the case of Jewish gnosticism. The chief passages, quoted above, forbid in general the teaching of this system, and Eleazar (3d cent.) refused in fact to let Johanan (d. 279) teach him it. Origen, who lived at the same time in Palestine, also knew the "Merkabah" as a secret science ("Contra Celsum," vi. 18; comp. Friedländer, "Der Vorchristliche Jüdische Gnosticismus," pp. 51-57, on Philo and the conditions of being initiated). Joseph, the Babylonian amora (d. 322), studied the "Merkabah"; the ancients of Pumbedita studied "the story of the Creation" (Ḥag. 13a). As they studied it together, they were no longer strict in preserving secrecy. Still less concealment was there in post-Talmudic times, and hardly any in the Middle Ages. Philosophy never has been hedged with secrecy, and the mandate of secrecy reminds one of the κρύβε, κρύβε of the magic papyri. Gnosis was concealed because it might prove disastrous to the unworthy and uninitiated, like magic formulas. By "correct knowledge" the upper and the lower world may be put in motion. When Eleazar was discussing the thronechariot, fire came down from heaven and flamed around those present; the attending angels danced before them, like wedding-guests before the groom, and the trees intoned songs of praise. When Eliezerand Joshua were studying the Bible, "fire came down from heaven and flamed around them," so that the father of Elisha b. Abuyah, the gnostic referred to below, asked affrightedly: "Do you mean to set my house on fire?" (Yer. Ḥag. 77a, b; comp. Lev. R. xvi. 4; Friedländer, "Der Vorchristliche Jüdische Gnosticismus," p. 59). These men were all pupils of Johanan b. Zakkai. When two other scholars interpreted the Merkabah the earth shook and a rainbow appeared in the clouds, although it was summer. These stories indicate that this secret doctrine revealed the eternally acting media of the creation of heaven and earth. Knowledge of this kind was dangerous for the uninitiated and unworthy. When a boy read the Merkabah (Ezek. i.) before his teacher and "entered the ḥashmal with his knowledge" [ ], fire came out of the ḥashmal [comp. Ezek. i. 4, "as ḥashmal out of the fire"] and consumed him [Ḥag. 13a], for the boy was one who knew [ = γνωστικός]. Gnosis is neither pure philosophy nor pure religion, but a combination of the two with magic, the latter being the dominant element, as it was the beginning of all religion and philosophy. The expression "to shake the world," used by the gnostic Bar Zoma (Gen. R. ii. 4, and parallels), reminds one of the origins of gnosis. The phrase "to trim the plants," occurring in the second leading passage on Jewish gnosticism, quoted below, must be noted here, for it refers, of course, to the influencing of the heavenly world by gnostic means. The ophitic diagram that Krochmal shows in the pictures that "may not be looked upon" (Tosef., Shab., and parallels), is evidently derived from magic, for the cabalistic sign of the pentagram is found on one of the earliest shards (Bliss and Macalister, "Excavations in Palestine During the Years 1898-1900," plates 29, 42; Dr. Emaus, in "Vajda, Magyar Zsidó Szemle," xvii. 315 et seq.). A mere reference to this view must suffice here; its importance has been noted by Anrich, l.c. pp. 86-87; it points the way to an understanding of Jewish gnosis. A few interesting examples may be given here. The following passage occurs in the Berlin Papyrus, i. 20, Parthey: "Take milk and honey and taste them, and something divine will be in your heart." The Talmud, curiously enough (Ḥag. 13a), refers the phrase, "Honey and milk are under thy tongue" (Cant. iv. 11), to the Merkabah, one of the principal parts of Jewish gnosis, saying that the knowledge of the Merkabah, which is sweeter than milk and honey, shall remain under the tongue, meaning that it shall not be taught (comp. Dietrich, "Abraxas." p. 157; "honey and milk must be offered"). The Valentinians taught that in order to attain salvation the pneumatic required nothing further "than gnosis and the formulæ [ἐπιήματα] of the mysteries" (Epiphanius, "Hæreses," xxxi. 7). "Four scholars, Ben Azzai, Ben Zoma, Aḥer [Elisha b. Abuyah], and Rabbi Akiba, entered paradise [ = πασάδεισος]; Ben Azzai beheld it and died; Ben Zoma beheld it and went mad; Aḥer beheld it and trimmed the plants; Akiba went in and came out in peace" (Tosef., Ḥag. ii. 3; Ḥag. 14b; Yer. Ḥag. 77b; Cant. R. i. 4). The entering into paradise must be taken literally, as Blau points out ("Altjüdisches Zauberwesen," pp. 115 et seq.). The following proof may be added to those given there: "In the beginning of the Paris Papyrus is that great ἀπαθανατισμός, in which the mystic rises above stars and suns ἔν ἐκστάσει οὐκ ἐν ἐαυτῳ ὤν, near to the Godhead. By such art Iamblichus, freed from his body, endeavored to enter the felicity of the gods ['De Mysteriis,' i. 12], and thus his slaves said that they had seen him, ten ells above the earth, his body and garments gleaming in golden beauty" (Dietrich, l.c. p. 152). Paul (II Cor. xii. 1-4) speaks similarly of paradise, a passage that Joel ("Die Religionsgesch." i. 163, note 3) misinterprets as a "picture of gnosis." This instructive passage is as follows: "It is not expedient for me, doubtless, to glory. I will come to visions and revelations of the Lord. I knew a man in Christ above fourteen years ago (whether in the body, I can not tell; or whether out of the body, I can not tell: God knoweth); such an one caught up to the third heaven. And I know such a man. . . . How that he was caught up into paradise, and heard unspeakable words, which it is not lawful for a man to utter." Philo says, similarly: "Some one might ask, 'If true holiness consists in imitating the deeds of God, why should I be forbidden to plant a grove in the sanctuary of God, since God did the same thing when He planted a garden?' . . . While God plants and sows the beautiful in the soul, the spirit sins, saying, 'I plant '" ("De Allegoriis Legum," §§ 52 et seq. ; ed. Mangey, §§ 117 et seq.). Philo here speaks also of trimming the trees. It is evident that this is the language of gnosis, but the words are used allegorically, as in Scripture. The literal interpretation here is perhaps also the correct one. The mystic imitates God, as Philo says, in planting a grove—that is, the mystic becomes himself a creator. He likewise has the power to destroy. There were books on the plants of the seven planets—for example, a work by Hermes, Βοτάναι τῶν 'Αροσκόπων (Dietrich, l.c. p. 157, note 1). Hence the planets were also regarded as "plantations," and Aḥer's "trimming of the plants" in paradise must be interpreted in this sense. Berechiah (4th cent.) interpreted the words of Canticles i. 4, "God brought me into his apartments," to refer to the mysteries of the Creation and the throne of God (Cant. R. ad loc. ; Bacher, "Ag. Bab. Amor." iii. 356). Hence he regarded the knowledge of the Merkabah as an entering of the apartments of God, or as entering the "Pardes." Akiba says to his companions who have entered paradise: "When you come to the pure marble stones, do not say, 'Water, water!' for of this it is said (Ps. ci. 7): 'He that worketh deceit shall not dwell within my house'" (Ḥag. xiv. 6). "Ben Zoma stood and pondered; R. Joshua passed him and addressed him once and twice, but received no answer. The third time he answered quickly. Then Joshua said to him: 'Whence the feet [ ]?' He answered, 'Nothing "whence," my master.' Then R. Joshua said, 'I call heaven and earth to witness that I will not stir from this placeuntil you answer me, Whence the feet?' Ben Zoma answered thus: 'I was contemplating the Creation, and between the lower and the upper waters the distance is not greater than two or three fingers' breadth, for it is not written that the Spirit of God "moved," but that the Spirit of God "hovered," just as a bird moves his wings, and his wings touch it and do not touch it.' Joshua then turned and said to his pupils, 'Ben Zoma is gone [ ].'" Ben Zoma remained on earth but a few days longer (Gen. R. ii. 17). The expression "is gone" refers to ecstasy, the corresponding expression in the parallel passages being ("he is always beside himself"). Thinkers have devoted much time to speculations on the creation of the world; even the Jews who were loyal to the Law connected these speculations with the first chapter of the Torah, which dominated the whole of Jewish life and thought. In order to check the philosophemes a scribe of the third century said, paraphrasing Prov. xxv. 2, "In the first chapter of the Torah it is the glory of God to conceal things; in the following ones, to search them out" (Gen. R. ix., beginning). In view of the unfriendly attitude of official Judaism the existence of the numerous gnostic allusions can be explained only on the ground that not all speculations on the Creation were held to touch upon the knowledge of the act of creation (comp. the principal passage in Ḥagigah). The wise Joshua himself gives an explanation of the Creation (Gen. R. x. 3). The leading questions of cosmology are: How, and by whom, and by what means, was the world created? "A philosopher said to the patriarch Gamaliel II. (c. 100), 'Your God is a great builder, but He had efficient means—clay, darkness, and water, wind, and watery depths [tehom]'" (Gen. R. i. 4). Johanan (d. 279) said: "One should not strive to know what was before the Creation, because in speaking of the palace of an earthly king one does not mention the dungheap that was formerly on that spot" (Ḥag. 16a). One may see the nature of these speculations from such passages: "If God had not said to heaven and earth: 'Enough!' they would still continue to extend" (Gen. R. iv. 6). God is therefore called ("he spake, = "enough"), and among the Naasenes 'Ησαιδαῖος = plays, in fact, an important part (Hilgenfeld, "Ketzesgeschichte des Urchristenthums," p. 257). The spheres of the sun and moon are in the second of the seven heavens (Gen. R. vi. 5). The creation of light was especially puzzling, several kinds being distinguished (ib. iii. 4). Jewish thought was particularly sensitive in regard to monotheism, refusing all speculations that threatened or tended to obscure God's eternity and omnipotence. 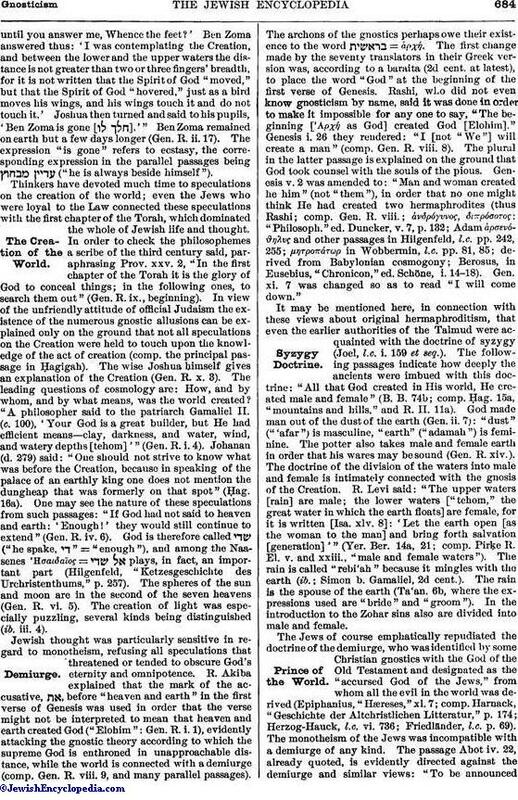 R. Akiba explained that the mark of the accusative, , before "heaven and earth" in the first verse of Genesis was used in order that the verse might not be interpreted to mean that heaven and earth created God ("Elohim": Gen. R. i. 1), evidently attacking the gnostic theory according to which the supreme God is enthroned in unapproachable distance, while the world is connected with a demiurge (comp. Gen. R. viii. 9, and many parallel passages). The archons of the gnostics perhaps owe their existence to the word = ἀρχή. The first change made by the seventy translators in their Greek version was, according to a baraita (2d cent. at latest), to place the word "God" at the beginning of the first verse of Genesis. Rashi, who did not even know gnosticism by name, said it was done in order to make it impossible for any one to say, "The beginning ['Αρχή as God] created God [Elohim]." Genesis i. 26 they rendered: "I [not "We"] will create a man" (comp. Gen. R. viii. 8). The plural in the latter passage is explained on the ground that God took counsel with the souls of the pious. Genesis v. 2 was amended to: "Man and woman created he him" (not "them"), in order that no one might think He had created two hermaphrodites (thus Rashi; comp. Gen. R. viii. ; ἀνδρόγυνος, διπρόσοτος: "Philosoph." ed. Duncker, v. 7, p. 132; Adam ἀρσενόϑηλυς and other passages in Hilgenfeld, l.c. pp. 242, 255; μητροπάτωρ in Wobbermin, l.c. pp. 81, 85; derived from Babylonian cosmogony; Berosus, in Eusebius, "Chronicon," ed. Schöne, i. 14-18). Gen. xi. 7 was changed so as to read "I will come down." 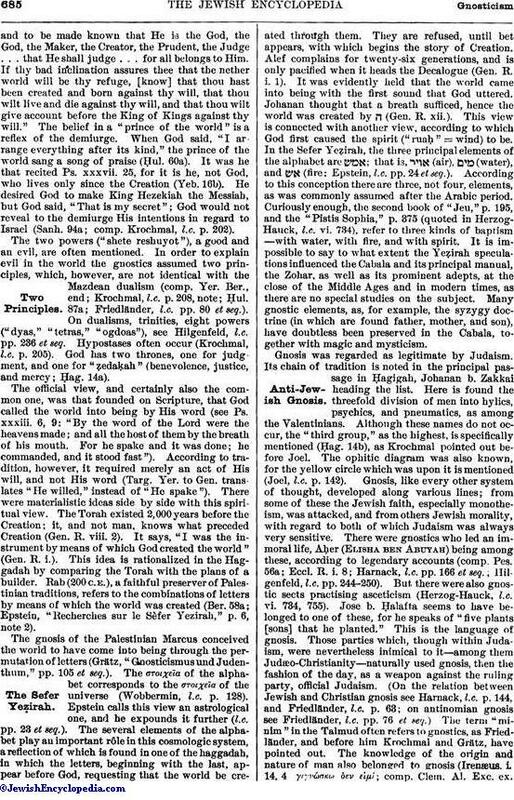 It may be mentioned here, in connection with these views about original hermaphroditism, that even the earlier authorities of the Talmud were acquainted with the doctrine of syzygy (Joel, l.c. i. 159 et seq.). The following passages indicate how deeply the ancients were imbued with this doctrine: "All that God created in His world, He created male and female" (B. B. 74b; comp. Ḥag. 15a, "mountains and hills," and R. H. 11a). God made man out of the dust of the earth (Gen. ii. 7): "dust" ("'afar") is masculine, "earth" ("adamah") is feminine. The potter also takes male and female earth in order that his wares may be sound (Gen. R. xiv.). The doctrine of the division of the waters into male and female is intimately connected with the gnosis of the Creation. R. Levi said: "The upper waters [rain] are male; the lower waters ["tehom," the great water in which the earth floats] are female, for it is written [Isa. xlv. 8]: 'Let the earth open [as the woman to the man] and bring forth salvation [generation]'" (Yer. Ber. 14a, 21; comp. Pirḳe R. El. v. and xxiii., "male and female waters"). The rain is called "rebi'ah" because it mingles with the earth (ib. ; Simon b. Gamaliel, 2d cent.). The rain is the spouse of the earth (Ta'an. 6b, where the expressions used are "bride" and "groom"). In the introduction to the Zohar sins also are divided into male and female. The Jews of course emphatically repudiated the doctrine of the demiurge, who was identified by some Christian gnostics with the God of the Old Testament and designated as the "accursed God of the Jews," from whom all the evil in the world was derived (Epiphanius, "Hæreses," xl. 7; comp. Harnack, "Geschichte der Altchristlichen Litteratur," p. 174; Herzog-Hauck, l.c. vi. 736; Friedländer, l.c. p. 69). The monotheism of the Jews was incompatible with a demiurge of any kind. The passage Abot iv. 22, already quoted, is evidently directed against the demiurge and similar views: "To be announcedand to be made known that He is the God, the God, the Maker, the Creator, the Prudent, the Judge . . . that He shall judge . . . for all belongs to Him. If thy bad inclination assures thee that the nether world will be thy refuge, [know] that thou hast been created and born against thy will, that thou wilt live and die against thy will, and that thou wilt give account before the King of Kings against thy will." The belief in a "prince of the world" is a reflex of the demiurge. When God said, "I arrange everything after its kind," the prince of the world sang a song of praise (Ḥul. 60a). It was he that recited Ps. xxxvii, 25, for it is he, not God, who lives only since the Creation (Yeb. 16b). He desired God to make King Hezekiah the Messiah, but God said, "That is my secret"; God would not reveal to the demiurge His intentions in regard to Israel (Sanh. 94a; comp. Krochmal, l.c. p. 202). The two powers ("shete reshuyot"), a good and an evil, are often mentioned. In order to explain evil in the world the gnostics assumed two principles, which, however, are not identical with the Mazdean dualism (comp. Yer. Ber., end; Krochmal, l.c. p. 208, note; Ḥul. 87a; Friedländer, l.c. pp. 80 et seq.). On dualisms, trinities, eight powers ("dyas," "tetras," "ogdoas"), see Hilgenfeld, l.c. pp. 236 et seq. Hypostases often occur (Krochmal, l.c. p. 205). God has two thrones, one for judgment, and one for "ẓedaḳah" (benevolence, justice, and mercy; Ḥag. 14a). The official view, and certainly also the common one, was that founded on Scripture, that God called the world into being by His word (see Ps. xxxiii. 6, 9: "By the word of the Lord were the heavens made; and all the host of them by the breath of his mouth. For he spake and it was done; he commanded, and it stood fast"). According to tradition, however, it required merely an act of His will, and not His word (Targ. Yer. to Gen. translates "He willed," instead of "He spake"). There were materialistic ideas side by side with this spiritual view. The Torah existed 2,000 years before the Creation; it, and not man, knows what preceded Creation (Gen. R. viii. 2). It says, "I was the instrument by means of which God created the world" (Gen. R. i.). This idea is rationalized in the Haggadah by comparing the Torah with the plans of a builder. Rab (200 C.E. ), a faithful preserver of Palestinian traditions, refers to the combinations of letters by means of which the world was created (Ber. 58a; Epstein, "Recherches sur le Sèfer Yezirah," p. 6, note 2). 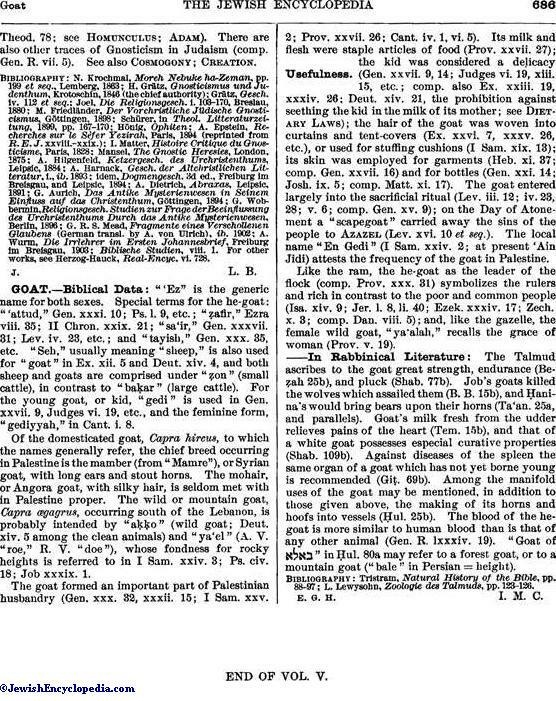 The gnosis of the Palestinian Marcus conceived the world to have come into being through the permutation of letters (Grätz, "Gnosticismus und Judenthum," pp. 105 et seq.). The στοιχεῖα of the alphabet corresponds to the στοιχεῖα of the universe (Wobbermin, l.c. p. 128). Epstein calls this view an astrological one, and he expounds it further (l.c. pp. 23 et seq.). The several elements of the alphabet play an important rôle in this cosmologic system, a reflection of which is found in one of the haggadah, in which the letters, beginning with the last, appear before God, requesting that the world be created through them. They are refused, until bet appears, with which begins the story of Creation. Alef complains for twenty-six generations, and is only pacified when it heads the Decalogue (Gen. R. i. 1). It was evidently held that the world came into being with the first sound that God uttered. Johanan thought that a breath sufficed, hence the world was created by ת (Gen. R. xii.). This view is connected with another view, according to which God first caused the spirit ("ruaḥ" = wind) to be. In the Sefer Yeẓirah, the three principal elements of the alphabet are ; that is, (air), (water), and (fire: Epstein, l.c. pp. 24 et seq.). According to this conception there are three, not four, elements, as was commonly assumed after the Arabic period. Curiously enough, the second book of "Jeu," p. 195, and the "Pistis Sophia," p. 375 (quoted in Herzog-Hauck, l.c. vi. 734), refer to three kinds of baptism —with water, with fire, and with spirit. It is impossible to say to what extent the Yeẓirah speculations influenced the Cabala and its principal manual, the Zohar, as well as its prominent adepts, at the close of the Middle Ages and in modern times, as there are no special studies on the subject. Many gnostic elements, as, for example, the syzygy doctrine (in which are found father, mother, and son), have doubtless been preserved in the Cabala, together with magic and mysticism. Gnosis was regarded as legitimate by Judaism. Its chain of tradition is noted in the principal passage in Ḥagigah, Johanan b. Zakkai heading the list. Here is found the threefold division of men into hylics, psychics, and pneumatics, as among the Valentinians. Although these names do not occur, the "third group," as the highest, is specifically mentioned (Ḥag. 14b), as Krochmal pointed out before Joel. The ophitic diagram was also known, for the yellow circle which was upon it is mentioned (Joel, l.c. p. 142). Gnosis, like every other system of thought, developed along various lines; from some of these the Jewish faith, especially monotheism, was attacked, and from others Jewish morality, with regard to both of which Judaism was always very sensitive. There were gnostics who led an immoral life, Aḥer (Elisha ben Abuyah) being among these, according to legendary accounts (comp. Pes. 56a; Eccl. R. i 8; Harnack, l.c. pp. 166 et seq. ; Hilgenfeld, l.c. pp. 244-250). But there were also gnostic sects practising asceticism (Herzog-Hauck, l.c. vi. 734, 755). Jose b. Ḥalafta seems to have belonged to one of these, for he speaks of "five plants [sons] that he planted." This is the language of gnosis. Those parties which, though within Judaism, were nevertheless inimical to it—among them Judæo-Christianity—naturally used gnosis, then the fashion of the day, as a weapon against the ruling party, official Judaism. (On the relation between Jewish and Christian gnosis see Harnack, l.c. p. 144, and Friedländer, l.c. p. 63; on antinomian gnosis see Friedländer, l.c. pp. 76 et seq.) The term "minim" in the Talmud often refers to gnostics, as Friedländer, and before him Krochmal and Grätz, have pointed out. The knowledge of the origin and nature of man also belonged to gnosis (Irenæus. i. 14, 4 γιγνώσκω ὄεν εἰμί; comp. Clem. Al. Exc. ex.Theod. 78; see Homunculus; Adam). There are also other traces of Gnosticism in Judaism (comp. Gen. R. vii. 5). See also Cosmogony; Creation. Biblische Studien, viii. 1. For other works, see Herzog-Hauck, Real-Encyc. vi. 728.